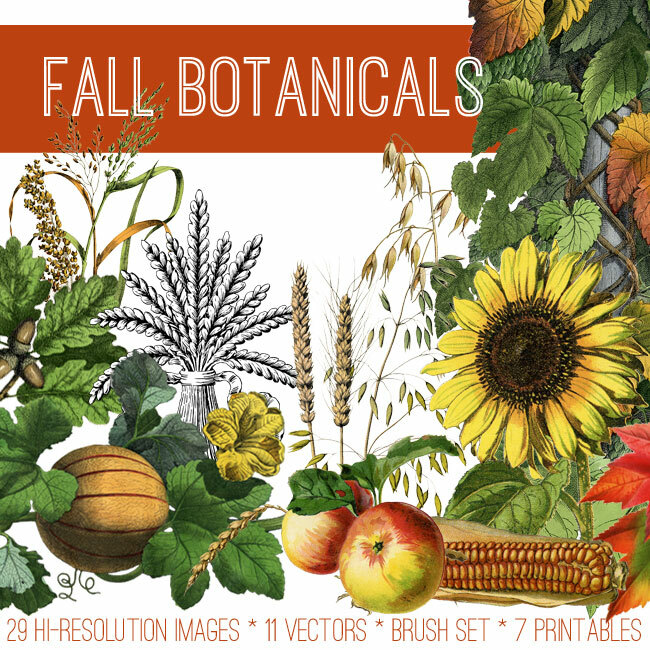 Today we’ve rounded up 10+ Vintage Fall Botanical Prints for you! We’ve searched through our Vintage Image Archives here at The Graphics Fairy to find our favorite Fall Natural History and Botanical Themed Images. Plus, we threw in a few DIY and Craft projects for inspiration! This is a great collection of some of our best offerings in this theme. These beautiful Graphics are perfect to use in your Fall DIY and Craft Projects (like Pillows, Guest Towels, Wall Decor, Signs, Jewelry, Scrapbooking, Mixed Media, Collage, Card Making, and more)! In this post, you’ll find 10+ links to Leaves, Fruit, Mushrooms, Birds, and even a cute Squirrel! Some are Vintage Jpeg images in full color, some are monochromatic, and some are Printable Wall Decor so there is lots to choose from! You can download all of the Vintage Freebies by clicking on the links below! 1) Fall Oak Leaves with Acorns Printable This is a gorgeous printable! It is a Circa 1875 Botanical Print of some beautiful Oak Leaves! According to the title of the print this is from a Scarlet Oak. The colors on this Antique Printable are so bright and lovely. The Leaves are done in tones of red and green, and there are several shiny brown looking Acorns on the branch as well. 2) Antique Botanical Yellow Apples This is a marvelous antique Botanical from Europe!! I picked this one up, along with a few others, and put them away to save for after the Holidays. I nearly forgot about them, but I’m glad they turned up! This is a wonderful Printable Wall Decor piece, or Instant Art as I like to call it! You might also like this Pear. 3) Natural History Dear Printable This beautiful Natural History Animal Print dates to about the 1860’s. Included on the print are a Long Tailed Deer, Virginian Deer and a spotted Fallow Deer. Aren’t they lovely?! I think the soft sepia tones in this print are really pleasing. You could print this out for some Instant Art, perfect for the Holidays or everyday. 4) Cute Vintage Owl Printable This is an Antique Natural History Print from my collection and it dates to Circa 1870. According to the title of the print this is a Little Owl. Cute! He has a very sweet face. You can find another Owl Printable HERE. You can use either, or both, for your Fall or Halloween DIY Projects! 5) Fabulous Vintage Mushrooms Printable This is a marvelous Old Print of an assortment of different Mushrooms. Included are a Common Mushroom, a Chantarelle and a Morell! Such a great looking print! This one was scanned from a Circa 1860’s Antique British Botanical Book! The paper has aged to perfection with its brown aged edges. There is such a great patina on this one, and so nice to frame for some Instant Fall Wall Decor! 6) Lovely Vintage Sunflower Printable This is a marvelous Old Print of a Bouquet of Flowers. Included in the bouquet are a big beautiful Sunflower and some Fig Marygolds! Such a pretty combination! This one was scanned from a Circa 1860’s Antique British Botanical Book! The paper has aged to perfection with its brown aged edges, and such a great patina on this one as well. 7) Beautiful Moth Wall Decor Printable This is fabulous! The print comes from a Circa 1863 German Natural History Butterflies and Moths Book. This is another book from my collection and there are so many gorgeous prints in it!! I’ve had a few of these individual prints in the past, so I was excited to get my hands on the entire book! I think the Yellow and Brown colors on this one make it the perfect print for your Fall Decor! I think this would look great under a glass cloche or behind the panes of an Old Window! 8) Vintage Printable Maple Leaves This is a gorgeous Vintage Printable Maple Leaves Print! Shown above is a Circa 1875 Botanical Print of some gorgeous Maple Leaves! According to the title of the print this one shows a Red Maple. The colors on this Antique Printable are so vibrant! The Leaves are done in tones of red, orange, yellow and green. The perfect Autumn tones! 9) Botanical Pears Printable This one dates to 1858. It has wonderful colors and would make some great Wall Decor! This would coordinate nicely with the Botanical Apples Printable HERE. 10) Marvelous Vintage Mushroom Collection Image This is a collection of various kinds of Mushrooms popping up on some Grass, and nice for your Fall or Garden themed Craft or Mixed Media Projects! 11) Cutest Vintage Squirrel Image Ever This Vintage Squirrel Image is the cutest ever!! This little guy was scanned from an Antique French Natural History Print. Just look at his adorable face!! I just love his sweet eyes and the little smile. He’s a lovely engraving that was hand colored many years ago. 1) Autumn Keepsake Album This reader featured project is an Autumn Keepsake Album from Lisa at Creative Juice Fresh Squeezed! Lisa repurposed a direct mailer package and turned it into this fabulous fall decor piece! She used die cuts and multi-media techniques along with The Graphics Fairy’s Sweet Vintage Playing In The Leaves Picture to create this keepsake album that celebrates autumn! 2) DIY Vintage Thanksgiving Signs Andrea from The Cottage Market made these fabulous DIY Vintage Thanksgiving Signs using several of the Vintage Thanksgiving Images! I love it because it is quick, easy and it shows off The Graphics Fairy’s amazing vintage graphics in a really fun way. 3) Spooky Halloween Coasters This reader featured project are some Spooky Halloween Coasters from Bella Manu at Art Club Blog! Bella used a few of The Graphics Fairy’s Vintage Halloween Graphics and transferred them onto wood pieces using an acrylic gel medium. You can find more about Transfer Methods HERE! I hope you will find lots of inspiration when you browse through these images, and that you come up with some creative ways to use them in your own Craft and DIY Projects! You might also like these Vintage Fall Kits, available as part of our Premium Membership Site HERE. For one low monthly (or one super low annual) fee you get a plethora of fabulous Premium Images and Photoshop Tutorials! New kits are added each week! 12+ Free Vintage Mother’s Day Images! 8 Circa 1905 Garden Flower Illustrations – Updated 10 Pink Botanical Clip Art Vintage Flowers- Updated! « Nostalgic Brown-Eyed Girl Holding Bouquet Graphic! Thank you Ardith, I am so happy you enjoy them! Thank you for reposting some of these especially wonderful images. The trees are my favorites. I really do appreciate your obsession! Thank you!